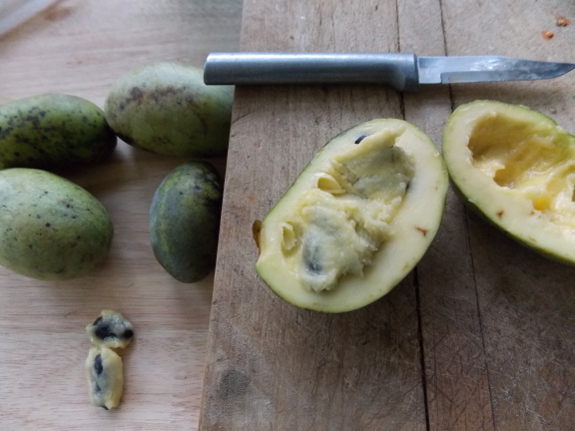 What does a pawpaw taste like? I'm afraid I've finally found a fruit I really don't like. I used to think the reason I had odd memories of pawpaws is because (after our family moved away from the farm), Mom would drive us out in the country to pick the fruits, and I always arrived carsick. However, I've been watching a pawpaw along our driveway all summer, waiting for it to ripen up, and when the first fruits hit the ground, I took the rest home to taste. There were no cars involved, so I definitely wasn't nauseous, but the fruits weren't something I'll seek out again. If I had to describe the flavor of pawpaws, I'd say they're sweet (of course) combined with a slightly bitter taste and an almost over-powering floral odor that sets me off the fruit. Perhaps if I'd held my nose while eating, I would have liked the taste better? 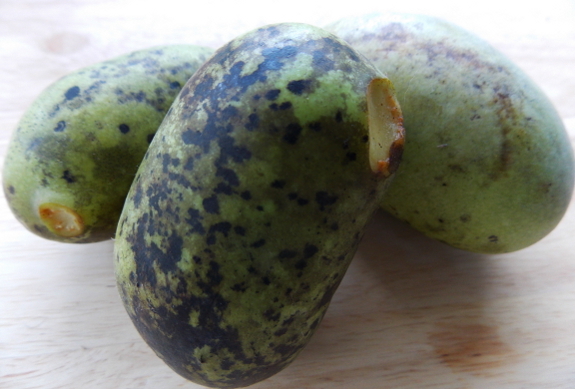 Granted, there are different varieties of pawpaws, as with other kinds of fruits. And it's possible some of the cultivated varieties taste better. But I like my fruits to have at least some tartness to them, and pawpaws fail that test. 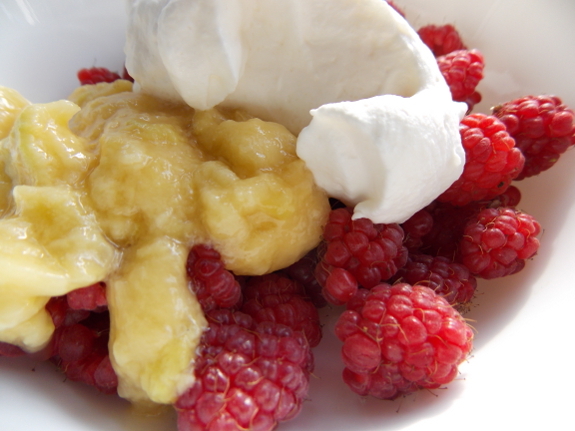 That's why my second experiment was to mash the flesh up with some lemon juice and honey, then add it to our raspberries and whipped cream. I hate to say it, but that was even less tasty than the flesh we ate plain, and I didn't mind when Mark picked the pawpaw off his berries. I'd be curious to hear from anyone who's grown named varieties of pawpaws. What varieties are you growing, and what do you think of their flavor? Our chicken waterer is the perfect present for a poultry-keeping homesteader. I didn't like the taste of pawpaw either. I tried it on two different occasions and both times it was like eating flowers. There was just way to much floral taste and scent for me, which was a shame because all of the talk about mango-bannana had me excited. However, I haven't given up hope for them yet. I'm going to plant a few cultivars and see if one of them tastes better to me. I might try fruit leather or something like that too. I have never tried one before, but I planted as "Sunshine" pawpaw about three years ago. It has blossomed but not fruited yet. I was hoping to try my first one next year if it fruited. Well, at any rate, it can't be worse than a durian. We have many wild patches here in SE Ohio. The flavor and texture varies, sometimes quite a bit, from patch to patch. I know what you mean about that bitter taste, and it is absent in some fruits. The sweetness does get to be too much, and after eating a few out of hand, we're done with that for the season. The rest we scoop and freeze to use like bananas in bread. Lots of other uses too. Pest resistance is hard to beat, as is nutrition, according to some research. I have never tasted a wild pawpaw that I liked (all from central NC) and most I thought nasty because of a strong and bitter aftertaste. That being said,however, pawpaw is my favorite fruit and there is no comparison between a good named variety and wild pawpaws I have tried. Good varieties are shenandoah, susquehanna, potomac, wabash, rappahannock, nc-1 and overleese. You should try and get a taste of one of these. But I notice that you like acid in your fruit so you may not like any pawpaw as they have no acid. They are mostly sweet with an assertive tropical flavor. They remind me most of a blend of banana, mango, pineapple, and vanilla though the flavor varies slightly between varieties. And some have texture like avocado.